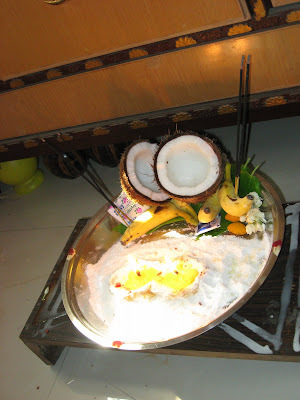 Maa-vilakku – literally, lamp made from flour, is an offering to the family deity. In our family, it is customary to make this offering on a Friday in the month of Thai (the month from 15th Jan to 15th Feb). Fridays in this month are considered auspicious, and even more so for us, due to this celebration. We put the Maa-vilakku yesterday, and it was even more special, since it was my birthday! 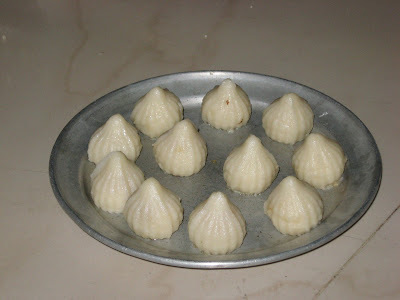 The Maa-vilakku is made from rice flour and jaggery. While in some houses, the two are mixed to form a dough and then shaped into a lamp, at our house, we simply spread the rice flour on a plate and then make the lamp with the jaggery and insert a wick in it. We then pour the ghee around the wick and then light it. When the wick is almost burnt out, but not completely, of course, we take the wick out with a spoon and keep it aside and offer the mixture of flour, jaggery and ghee to the deity. These are then mixed with grated coconut and are distributed to married women along with vettalai-pakku (betel leaves and betel nuts – the traditional offering to married women). The Maa-vilakku is believed to be an offering to the family deity, as a thanksgiving, and also a prayer for prosperity. As far as Samhith is concerned, it is a feast, for he loves anything that has jaggery in it, eating not just the Maa-vilakku mixture, but also plain jaggery all day long. And even more interesting for him is the other offering we make to the deity –kozhakattai – Modaks! Now you know what Samhith had for dinner last night!!! Belated happy birthday Anu and the lamps do look special! At home, we put during the Aadi month. Till I saw a similar post at another blogger's, I never knew ma-vilaku will be put during Thai maasam too. Lovely modaks. @ Mridula : THanks a lot.... yes, i have often wondered who came up with such interesting ideas! Well I am late but better late then never. @Patricia : Thanks!!! Samhith is the only one at home who loves sweets! he will be glad to hear he has company! @Shekhar: Thanks.... its never late! Thanks to blogging, i have received more wishes than ever! I hadn't heard of this celebration before. Is it particular to the region or some communities only? A form of thanksgiving is always humble to celebrate. May God bless you with a wonderful year, lot of happiness and more blogging time !! Mom makes mavilakku maavu, but dont know if she has a set day... on n off i've seen her do it..another aunt also makes it, quite often!! and so different like our food !!! yummy yummy kozhakattias :) cool! in our home, we put the maavilaku with ghee on top of the mountain and we wait until the flame runs out calling govinda govinda! First of all, belated, Wish You A Very Happy Birthday Anu. Reading and seeing the post, I know that you enjoyed your birthday with the deities; what an honor! @Vidya: Great to hear that u do it too....that too twice....same in my mom's house.... we always use jaggery.. so no idea abt brown sugar......does it taste the same? @Bhavesh: thanks a lot.... oh yes, i did have fun! and samhith waits for the 5 times we make modaks in the year :) and keeps asking when we shall make it next!!! Your post reminded me of the maa vilakku we light at our kula deiva koil at siruvacchur( near trichy) every year. At this temple we have facility for pounding the rice flour. and then along with that we add burachakkarai( unproccesed) and light with ghee. This thai velli we too made kozhakattais. belated b'day wishes to you and BTW are you in a madisar in your Display picture. and by unprocessed, do you mean 'vella-chakkarai' or 'naatu chakkarai'? Good to read about Maa-vilakku, thanks for sharing. And please accept my belated birthday greetings Anu. Yes anu, Unprocessed sugar i meant the burachakkarai.